I'm grumpy today over nerds. So for a project for work, I've been given a project that includes drawing a "man with glasses, slightly nerdy." The problem is, looking for "slightly nerdy man" on Google images is just filling me with anger because there IS no such thing as an image of a person that's supposed to evoke 'slight' nerdiness. All I'm getting are pictures of stereotypical revenge-of-the-nerds type stock photos or worse. 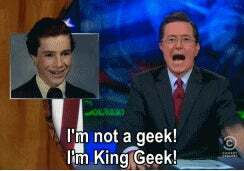 I feel like, even in 2014, nerds and geeks are STILL nothing more than a joke to everyone and that bums me out. I mean, we've had a few semi-positive to positive portrayals of nerds in popular culture lately; Chuck was a great example, even though it only applied to Chuck himself, as everyone else on the show that classified as a nerd was either the mouth-breathing horndog basement dweller or a drunk. Or both. Then I started thinking about other nerds in pop culture. Stargate! I love Stargate! Daniel Jackson was a GREAT picture of a positively portrayed nerd... y'know, when he wasn't being a giant prick to everyone and talking down to them because he was sooooo much smarter than everyone else. How about Ghostbusters? My all-time geek favorite! A team of scientists busting ghosts! Okay, to be fair, Egon was pretty far out in left field, what with his spore, mold and fungus collection... and Ray wasn't a scientist so much as he was an occult enthusiast... and Peter wasn't so much a geek as he was a con man who somehow ended up in a teaching position... and Winston! Winston actually holds a doctorate in Egyptology and history! ...although he only has like five lines during the course of both movies. Now, to be fair, there are positive role models for us out there; Peter Jackson pretty much proved that you can take the absolute geekiest thing on earth and make it into a multi-billion dollar cash cow that appeals to a huge audience. Joss Whedon took the Avengers and made them a household name, even amongst those who don't even read comics. Stephen Colbert... well, he's just Stephen Colbert. ...But these people are few and far between, and for every example of a positive geek role model, you'll find dozens more who will exploit what they see has a helpless target for entertainment purposes. Because nerds don't speak up when we wound them, do they? Because nerds are helpless, hopeless, friendless... and if they do speak up, we can just call them nerds and shame them into silence again. Do you know why all of this bums me out? Not for me personally, but for my daughter, who, at the age of three months, is already fascinated by Star Trek and David Attenborough-narrated nature programs, and who is going to have to deal with stereotypes of what a nerd is and is not, and what a girl should and should not be, and sadly, I can't punch everyone that will inevitably turn their nose up at her and insist she's not a real geek because of her gender.